The Reception Room of Johnny Mathis' Rojon Productions, Inc. office suite makes an impressive statement of Johnny's 27-year career as a Recording Artist. The pale orange walls of the elegant little room are covered with framed awards of Gold and Platinum records presented to Johnny over the years - from the United States, the United Kingdom, France and Australia. (See my "Los Angeles Report" of August 1981.) A variety of colorful plaque awards compliment and complete this awesome display. A recent observation of these pride-producing walls revealed that a new plaque had been added, placed neatly next to the one from the Mayor of Los Angeles. A bright yellow child-painting sunburst symbol decorates the top of the plaque, which reads: "Young Audiences of Greater Los Angeles, Inc. Presents An Award of Appreciation To Johnny Mathis For His Support of Art Education" and "The young people of Los Angeles whose lives are enriched through the music, dance, theatre and visual art experiences provided by Young Audiences are very fortunate to have Johnny Mathis as their champion for arts education. Without support such as his the organization could not reach over fifty thousand children annually with arts programs throughout the Los Angeles area." and "The Board of Directors of Young Audiences extends its warmest gratitude." On Sunday, October 24, 1982, Young Audiences of Greater Los Angeles, Inc. presented a matinee benefit concert to honor Johnny Mathis, for his support of arts education for young people. "Come sip the wine . . . Come hear the music . . . Come celebrate the arts" . . . the special invitations had handsomely beckoned the potential guests to make their reservations early, to send in their donations ($50 a ticket per person) to this very worthy cause. The Matinee (as it was officially titled) would include musical presentations by the Honoree Johnny Mathis, as well as by Peter Nero - plus live and continuous music from the Classics to the Big Band Sound. It was to be held from 2:30 to 5:30 on the University of Southern California campus, at the University Art Galleries, Fisher Art Gallery - located just a few miles to the south of the Los Angeles Civic Center. An interesting note: across the boulevard from the University of Southern California, better known simply as USC, is Exposition Park, the home of the Los Angeles Memorial Coliseum, and the future site of the Summer Olympic Games, 1984. The traffic flowed easily along Exposition Boulevard as guests stopped their cars at the Fisher Gallery entrance, and polite valets promptly attended to the parking. The sun was brilliant and gloriously warm - very typical of a splendid Los Angeles autumn day. Ladies arrived wearing light summer clothes, the gentlemen mostly in standard California sportswear. Strolling through the art galleries, the guests viewed four exhibitions exploring women as subject by contemporary and old master artists. Just beyond the galleries, a lovely courtyard awaited . . . here the music of The Matinee would be heard . . . the wine would be sipped. Long tables covered with snowy white linen cloth were arranged on the veranda, offering a varied assortment of wines - while other tables presented an abundant variety of cheeses, breads and fruit. At the far end of the courtyard, a small green stage had been set up, with perhaps 20 rows of folding chairs assembled in front of it. Countless pots of cheerful yellow flowers, lush jade hedges, lofty green trees and an emerald lawn decorated the courtyard, giving it an atmosphere of sheer peace and gentle tranquility. 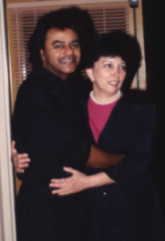 The concert began exactly at the scheduled time, with Mistress of Ceremonies Blythe Rainey Cuyler, Executive Director of The Young Audiences of Greater Los Angeles, introducing the Special Guest, pianist Peter Nero. Peter then performed an excellent Gershwin medley, including many songs from "Porgy and Bess" and playing non-stop for some 20 minutes. Finally, Blythe introduced the Guest of Honor . . . Johnny Mathis. Accompanied by his own group of musicians (Jim Ganduglia, conductor, Gil Reigers, Michael Bach, Larry Steelman and Joe Lizama), Johnny launched his part of The Matinee with his dazzling rendition of "Begin The Beguine." Wearing a dark blue blazer, white shirt and pants, stripped blue-red-white tie, Johnny sang with power and gusto - to the great delight of every individual in that afternoon audience, to every person situated within the sound of his incomparable voice. Dozens of USC students suddenly appeared on nearby rooftops to look and listen, and catch a free performance! Next Johnny favored his grateful guests and those imposing porticos of learning with his favorite song, the beautiful and timeless "Misty." Subsequently, Johnny said a few words about Young Audiences, stating that he was enormously pleased and proud to be associated with this very important organization. After that, a troupe of some 15 school children (average age about 10 years) joined Johnny on stage, they wore blue jeans and white T-shirts with the bright yellow child-painting sunburst symbol of Young Audiences across the front. "What's new? What's new? What's new at the zoo?" sang the children. Johnny responded: "Ouch! You're stepping on my pouch, to the bear said the kangaroo. Oh! You're stepping on my trunk, to the gnu said the elephant. The seal flipped his flippers, swallowed several kippers, then they all began to chant . ." The children merrily insisted: "Let us out. Let us out. The zoo is overloaded." It was the song that Johnny had recorded back in the middle 60's with the Young Americans, and it represented pure charming fun! At the end of "What's New At The Zoo?" Johnny spoke to the children, interviewing a couple of them individually, and thanked them for singing with him and doing such a good job of it. "You guys sang your part much better than I sang mine." he chuckled. Then Johnny very appropriately sang to the children, and to the guests, his final song: "When A Child Is Born." Lastly, Johnny received his Award from Young Audiences of Greater Los Angeles, Inc.
A social hour followed, and Johnny mingled casually with his guests. Faces beamed with happiness at the opportunity to speak with Johnny, and he was his ever gracious, friendly and unassuming self. A few photographs were taken, a few autographs were signed - but mainly people were content to simply share a tiny space in time with Johnny, to say some special words to him that might have been held in their hearts for just such a moment. The lively dance music played, the chatting, laughing, sipping wine . . . what a moment indeed! "It's been a really nice day, John." I chanced to say to him. "Yes. But I don't feel any smarter." He kidded, with a look of mock disappointment, looking around, as if to say that those hours that he had spent in this University environment should have endowed him with some portion of "smartness." (A little joke.) Later, he caught a brief peaceful moment alone, standing under a tree, with his glass of wine. I brought him a bunch of green seedless grapes, which he enjoyed dunking into his wine, and biting off with eager and playful teeth. 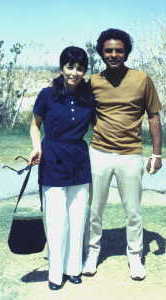 Gil brought a lady over to him, and said that she was "a friend of Maria's" and that she had been attempting to get an autograph from him all afternoon. Johnny looked so apologetic and said: "Oh, I didn't know that!" He signed her program. Eventually, Johnny had left the courtyard, Fisher Gallery, USC . . . the valet brought his orange Mercedes, and he drove away. Going home from the Young Audiences event, I considered my good fortune. It had been a superb occasion, and I had been there to see it, to live it, to enjoy it thoroughly. No, I didn't feel any smarter either, but I felt a lot happier. "Yipes! My stripes. Oof! My hoof. Ouch! My pouch. Oh! My toe. Ugh, Ee, Ow, Oh, Ooh?!" I found myself singing out loud, and pointing my inquiring index finger at an unsuspecting driver in the car next to me. The Young Audiences had thanked you, and I thank you too . . . Johnny Mathis. The most famous sidewalk in America is located in that very special district of the City of Los Angeles called Hollywood. This sidewalk has been designated as a Cultural/Historic Landmark, and has gained international fame as a major tourist attraction. It is known as the Hollywood Walk of Fame. The Walk of Fame has perpetuated the aura which made Hollywood synonymous with entertainment and glamour. It has revitalized some of the sparkle of yesteryear. The Walk of Fame is a veritable chronological history of the entertainment industry, as it honors the stars of past and present who made Hollywood the entertainment capital of the world. It was dedicated in 1961. The Walk of Fame consists of the sidewalks that line both sides of Hollywood Boulevard for a distance of some 16 blocks, and the sidewalks of both sides of Vine Street for 3 blocks. The sidewalks are comprised of 2,519 bronze stars embedded in pink terrazzo, surrounded by charcoal terrazzo. The stars measure about 34 inches across, from point to point. To the present, nearly 1,600 of the bronze stars have been used to mark the names of Motion Picture, Radio, Television and Recording stars. The bronze letters of each name are embedded in the pink terrazzo, within the boundaries of their bronze star. Beneath the name is the accompanying bronze emblem, designating the category: a film camera for a Motion Picture star, a microphone for a Radio star, a Television set for a Television star, a record disc with a phonograph arm across it for a Recording star. 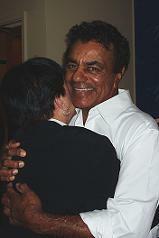 Johnny Mathis was selected to receive a Walk of Fame star in 1972. His star is located at 1501 N. Vine Street, very nearly to the corner of Sunset Boulevard. It is an appropriate and practical location for Johnny's star, because his Rojon Productions, Inc. office suite is located just across the street, on the 17th floor of the Sunset-Vine Tower. 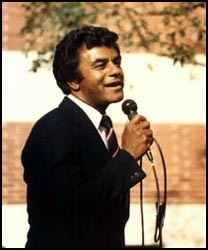 The Installation Ceremony of Johnny Mathis' Walk of Fame star took place on Thursday, June 1st of 1972, at 10:00 a.m. It was a beautiful, sunny California morning, the traffic was mild, as it quietly hummed by along Sunset Boulevard, with few cars on Vine Street. Johnny's star was veiled with a wood star-shaped frame that was completely covered with green velvet, and attached to it were a pair of golden braided ropes. People began to arrive long before ten o'clock, with each person taking a place on the sidewalk surrounding Johnny's soon-to-be-revealed star. There were fans and friends and persons from Columbia (CBS) Records, including Johnny's producer Jack Gold, there were officials from the Hollywood Chamber of Commerce, and the assigned photographer. Gradually the gathering grew, and the excitement and anticipation were visible on every smiling face. The time was approaching, and suddenly there were a few ohs! and little gasps . . . Ralph Mathis, Johnny's younger brother, was walking across Sunset Boulevard, looking very dapper in a dark green suit, and some of the fans had briefly mistaken him to be Johnny. A bit more time passed, and then the awaited moment arrived. Without any doubt, Johnny Mathis came strolling across Vine Street. He was accompanied by his father, Clem Mathis. Johnny looked content and comfortable, as he smiled casually and unassumingly towards the crowd that watched him with eagerness and admiration. Clem beamed with joy that was evident, and he glanced at his son with a smile of pride. Johnny wore a light-weight plaid blazer, a pale yellow short-sleeve turtle-neck light-weight sweater, immaculate white pants and white shoes. Clem wore a navy-blue summer suit, white shirt and blue on white print tie. Both father and son looked very handsome, and it was wonderful to see them together, and to easily conclude that they were truly the best of friends. A moment later, Ray Haughn, Johnny's business manager, arrived, impeccably attired in a dark brown suit. He was accompanied by Joan Bullard, Johnny's attractive public relations person. Then Johnny took his place in front of the star, with the men from the Chamber of Commerce . . . and the ceremony began. A young boy representing the Hollywood Y.M.C.A. presented to Johnny a polished-wood shield-form plaque, for his continued support and contributions to this organization. The boy addressed Johnny with a short, nervously delivered speech, and Johnny smiled at him with obvious patience and understanding. Next, the Chamber of Commerce presented Johnny with the large and impressive official certificate-plaque of the City of Los Angeles (State of California) to commemorate the event of his star installation on the Walk of Fame. It was finally time for the important moment, the unveiling of the star. Johnny and the two men from the Chamber of Commerce grasped the golden ropes and lifted the green velvet covering off the sidewalk. Johnny's Walk of Fame looked very grand! The bronze of the star and his name and the record disc gleamed brightly in the sun, and the pink and charcoal terrazzo seemed more vibrant than usual. There was a round of appreciative applause. Johnny looked down at his star, and his facial expression was of pleasure and gratification, as he studied it with approval. There followed a steady flow of verbal congratulations and handshakes and photo-taking. The photographer requested several official poses . . . Johnny and Clem and Ralph in front of the star, Johnny and the Chamber of Commerce in front of the star, Johnny and his City of Los Angeles plaque in front of the star . . . The sun was getting quite warm, and Johnny decided to remove his blazer. He handed it to Joan, who was now holding the two plaques. Dozens of persons began to approach Johnny for autographs, and he was very obliging and friendly and gracious to everybody alike. Clem stood on the sideline and observed the activity, while he chatted with friends and fans, expressing his pride and happiness. Johnny did not seem to tire as he stood there signing his name to an endless stream of pieces of paper, photos, album covers. And it seemed to be a timeless scene . . . all of its aspects were perfect and indigenous . . . Johnny Mathis, the corner of Sunset and Vine, in front of the well-known Wallich's Music City, happy fans abounding, the California sunshine on our shoulders. Eventually, Johnny began to ease slowly away from the crowd, still signing a few remaining autographs, while he took little sideways steps. Joan led the way, and people reluctantly parted to make a path for Johnny. He chanced to walk near me, and quite unexpectedly our eyes met. I received this quick but friendly greeting from him: "Hi, Maria. How are the kids?" Before I could answer, a dozen fans stepped in front of me. (It doesn't pay to be a short person.) There was a last glimpse of Johnny as he walked across Sunset, and then Vine, and he disappeared through the doors of the Tower. After Johnny's departure, nearly everybody left soon. But many of us stayed to linger, to have a good look, to admire and photograph the star, now that the area was clear. It had been a unique and memorable event for all of us who were present on that distinguished June 1st. It had been a day of pride and reflection for Johnny and his family, for everyone who loves him and is concerned with his career. And although that day is but a lovely and indelible memory, we have the ever present knowledge that Johnny Mathis' Walk of Fame star will remain on that exclusive spot of Los Angeles for a tangible always. Now and in the future, anyone of us may visit that medallion that adorns the very special sidewalk, that bronze star that proclaims the fame and greatness of our beloved and very favorite Recording Star . . . Johnny Mathis. 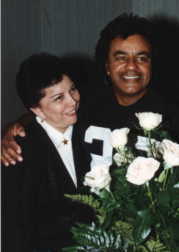 On the beautiful, bright and sunny morning of Wednesday, July 5, 1995, Johnny Mathis was honored by Los Angeles' famous Greek Theatre. Johnny has performed a total of 77 concerts at the Greek Theatre, over a span of 35 years, from his first week-long engagement in September of 1960 to his recent 2-day engagement on July 14/15. Johnny has sold nearly 300,000 seats at the Greek Theatre, which makes him the second-largest ticket seller in the history of this out-door theatre, located in Los Angeles' scenic Griffith Park. The induction ceremony began at 10:00 A.M. with a large crowd of Johnny's friends, family, staff and fans in attendance, along with a huge group of media people and cameras. The "Wall of Fame" was created to honor performers who have sold more than 100,000 seats at the Greek Theatre, and this is the 3rd year that they have inducted an artist into the "Wall of Fame." The first year, it was Carlos Santana. The second year, it was Harry Belafonte, who is the first-largest ticket seller in the theatre's history. Johnny arrived at the Greek Theatre early that Wednesday morning, accompanied by his Rojon staff, including Robert and Dianna, Gil and Mark, John Scott Lavender, Joe Lizama, Eric Messerschmidt, Richard Holsten and Richard Bevan. While Johnny's mellifluous voice was played on theatre speakers for all to enjoy, the front of the tree-surrounded theatre bustled with activity, and it's black-with-white-letters marquee proudly announced the day's event: CONGRATULATIONS JOHNNY MATHIS GREEK THEATRE WALL OF FAME INDUCTION JULY 5, 1995 A festive black/red stage at the sun-lit entrance of the theatre with glass podium and line of chairs was set up, and the ceremony began with the introduction of the inductee: Johnny Mathis. After the initial speeches, Johnny signed the cement block, to loud applause and cheers, and lots of photo-taking. Johnny graciously thanked everybody for attending his "Wall of Fame" Induction, and he talked about how he loves performing at the Greek Theatre. A presentation was made from the office of the Mayor of Los Angeles ... "I think it is a great honor, here at the Greek Theatre, to have this wall that celebrates the great artists of our community, and Johnny Mathis is certainly one of those artists. ... We have this beautiful space (Griffith Park/Greek Theatre) and we have this beautiful artist, whose music will be here for hundreds of years from now, because of his soul and beauty and inspiration, and his hard work and perseverance as an artist." The theatre's general manager then presented to Johnny a special jacket with the "Wall of Fame" logo. At the end, photographers pressed Johnny for more poses with his autographed cement block. 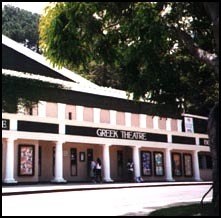 A reception followed in the Greek Theatre's Green Room.